ARE WE ABLE TO ADDRESS THE CHALLENGES THAT WE FACE MORE EASILY BECAUSE OF OUR REPUTATION FOR BEING RELIABLE, INNOVATIVE, AND TRUSTWORTHY, AND HOW DO WE CONVERT THAT REPUTATION INTO VALUE? AGRICULTURE IS A driver of economic prosperity in Canada and grain exports have the potential for enormous growth over the next decade. Farmers are positioned to benefit from the expected increase in demand for raw commodities from developing nations and there is also the potential for Canada to double its processed foods exports. The difficulty will be overcoming barriers to growth such as an under developed value chain, trade tariffs, and government regulations. The answers to these two questions were the focus of panel discussions and presentations during the 2018 Canadian Global Crops Symposium. Murad Al-Katib, president and CEO of AGT Food and Ingredients Inc., is all too familiar with the potential of Canadian agriculture and the challenges that exist. In 2017, he was appointed to the National Agri-Food Strategy Roundtable that was created to advise the federal government on how to create jobs in agriculture, identify sector-specific challenges, and create a plan to support Canada’s global success and competitive position. The building blocks of the growth strategy being developed by Al-Katib and the Roundtable are to set an ambitious aspiration ($30 billion in growth over the next decade), launch a few bold pilot projects, implement the Council’s core recommendations for the agriculture sector (including infrastructure improvements), and increase public-private collaboration. Al-Katib tells farmers they shouldn’t grow a crop because they can, rather, they should grow a crop because there is a customer to buy it at a price that is able to deliver a return on their investment. Sustainability practices, such as the three crop rotation already in use by grain farmers, gives us an advantage and a good story to tell buyers of our grain and ultimately the end consumer. We also have a strong reputation for quality, safety, and delivering on our contracts. Gauthier also notes that preferential trade agreements are crucial for our export interests. We are the only major agriculture exporting country to have a preferential agreement with Europe and with our continued participation in the Trans-Pacific Partnership we have a leg up on our U.S. counterparts. “China has interest in a preferential agreement with Canada, but it’s been difficult to come to an agreement. We may need to look at a smaller trade agreement that deals with corn issues first and then a few years later you add in other things,” notes Gauthier. 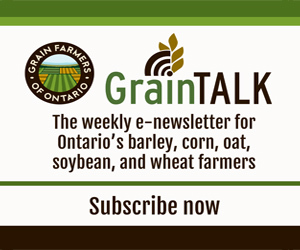 Global trade and regulatory hurdles aside, Canada’s reputation as a trusted grain supplier has resonated with some buyers who have been utilizing our commodities for years. The largest flour mill in Indonesia sources Canadian wheat which is blended into flour to make pasta, bread, and instant noodles. Bobby Ariyanto, senior vice president with Bogasari Flour Mills, a division of PT Indofood Sukses Makmur, says flour use has increased significantly over the past decade. The most significant growth has been seen in the consumption of instant noodles. That’s led to an increase in their milling capacity and an increase in the food processing by the other divisions of P.T. Indofood, including snack foods, food seasoning, and specialty foods. “The flour milling done today is more and more difficult because competition is increasing for high quality products. Innovative products are in demand. We have increased our productivity and efficiency in processing, but we need good material and we need to be more competitive in raw material sourcing,” says Ariyanto. Indonesia imports more than eight million tonnes of wheat, the majority of which comes from Australia, Ukraine, and Canada. More than half is used in the noodle market, a quarter goes to the bread market, and the rest to cake and biscuit markets. Ariyanto explains that Canadian wheat isn’t used for biscuit or fried flour production because there isn’t a large enough supply of soft wheat available to make these products. “We know that Canadian wheat is a good base for many Indonesian foods, for example bread, noodle, and pasta. Canada has a good reputation of quality, our customers have more confidence in our product when we use Canadian wheat,” says Ariyanto. However, he does note some challenges. They have to add an enzyme to increase the gluten content if the protein is low and this increases their production cost. A lighter colour is also more desirable for white noodles and Australian wheat is better in this respect. Ariyanto is also concerned about the high moisture content that can develop if wheat is stored for a long time. And when compared to other export countries, the freight costs and time for delivery are disadvantages for Canadian wheat. The transportation of raw commodities is also an important production factor for Soon Bin-Neoh, managing director of Soon Soon Oilmills which operates 13 factories in Malaysia. They process soybeans for food and crushing, canola, yellow peas, and wheat. Malaysia is part of the 10 country ASEAN alliance which imported 7.5 million metric tonnes of soybeans in 2016. The region is dependent on imports for soybeans as production there is very low. Bin-Neoh also respects the quality of Canadian soybeans, which have higher protein content and produce a larger amount of soybean meal. He also notes that supply chain reliability has made Canada the top source for non GMO Identity Preserved soybeans, with 80 per cent being sourced from Canada. For crushed soybeans, high protein is important in the dehulled meal product. It needs to be 46 per cent and lately some Canadian soybeans from Manitoba have struggled to reach this level. Bin-Neoh says that if more acres are to be planted in Manitoba, farmers should concentrate on achieving higher protein levels to ensure there is a market for their crop. This type of feedback from industry stakeholders is important to understand where Canada stands in the global marketplace, whether we are living up to our reputation, and if we are meeting the needs of our customers. The symposium also explored other issues affecting not only our global reputation but also our ability to innovate Canadian agriculture, such as the need for faster global approval of new biotechnology, the need for broader collaboration amongst plant breeders, and consumer acceptance of GMOs. You can learn more about the conversations had at the Canadian Global Crops Symposium here. Grain Farmers of Ontario was the event sponsor for the 2018 Canadian Global Crops Symposium held in Toronto. This is the first time the Canada Grains Council has hosted the event in eastern Canada. Grain Farmers of Ontario’s Board of Directors and senior staff attended the event. Senft notes that the decision to hold the event in Ontario also provided an opportunity to show our western counterparts and global customers first-hand the industry we have here.